Hello my sweet friends and Happy Easter! Playing along with a few challenges today. First off, I’ve used the gorgeous color combo from Colour Me #16 – pistachio pudding, blushing bride, calypso coral and a neutral. Since I don’t have all the colors, I’ve used similar colors of Distress Inks. The three shades of Distress Inks were sponged through a stencil and lightly misted with water. Then I added more droplets of water with my fingers. Once that was dry, I dribbled some gold Color Shine across the paper. Next the sentiment and little rows of triangles were stamped in black, I added a smattering of sequins and done! oooohhh… Love it! I just love distress inks and the stuff they can do, don't you? Your watercolour look, combined with the sequins and that sentiment are just perfect! 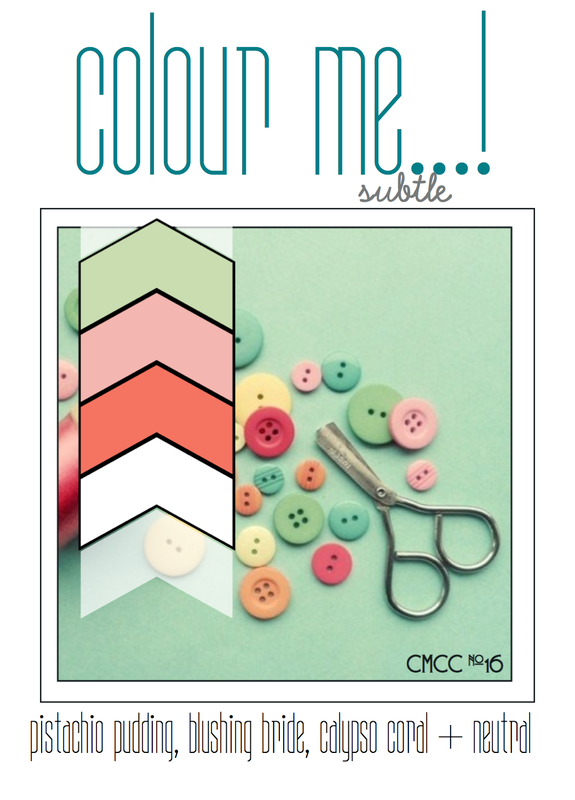 Thanks for playing along at Colour Me…! this week! Gorgeous and fresh, love this! So glad you joined us this week at Colour Me…! FAB.U.LOUS take on the color combo… this one is a real jaw-dropper, Lee-Anne!! thanks so much for playing along with Colour Me. Such a pretty card and I love the stencils and pretty inks you used. The arrows are superb, along with the wonderful sentiment. OMGosh, this is so yummy pretty! I love the colors and how you used the stencils too! Wow Lee Anne the stenciled background is awesome with the sentiment and design. Oh my God!! Lee Anne is is incredibly beautiful. Love the grunge stenciling and the sequins 🙂 this is so inspiring ! !